Today we have somewhat of a retro cap for the team now known as the Los Angeles Angels of Anaheim. The team that has had it's fair amount of success over the past decade most certainly paid their dues to get to where they are at. An expansion team which started in the 1961 season, the halos began play in the West coast version of Wrigley Field in their first year of competition, then spent four years at the home of the other L.A. team Dodger Stadium, all before finally having a home of their own in 1966. After a 38 year period of ownership by old time singing cowboy Gene Autry, the team was purchased in 1997 by the Walt Disney Company. At this time a complete overhaul of the franchise was executed and the club as well as there recently renovated home took on a new look family friendly atmosphere. With this new state of mind, the team got right to business on winning a championship. In their first 38 seasons of life, the team won 3 Western Division titles. Since the change of ownership (including the current Arte Moreno reign), the team has captured 5 AL West titles, a wild card berth, and a World Series Championship. Maybe Disney is really where dreams come true. Despite what may be called a lack of success in the early part of their history, the team sure had it's share of big name players who put up big numbers. A few of the retired Angels numbers are in honor of Nolan Ryan, Rod Carew, and Jim Fregosi. 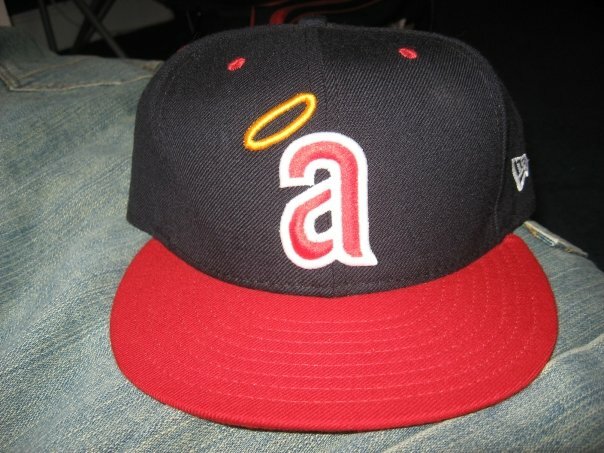 The cap shown above was worn by the Angels during the 1971 campaign and features a red brim, navy crown, and a lowercase "a" n red and outlined in white. Don't forget the golden halo hung on top. Classic cap which I wish they would bring back, but seem to have those years in the rear view mirror for good.